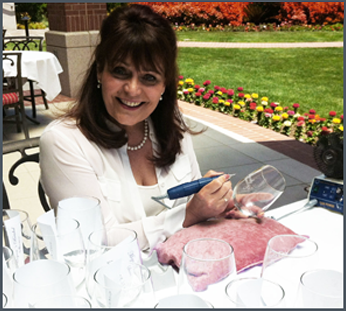 We bring our equipment to your event to engrave on-site, providing your guests, clients and customers with a personalized item – that they will cherish with the memories of the event and your company. We engrave for Retail Stores, Corporate Events and Trade Shows. Discover what we can do for your event or activation . . . Logo Apparel and Merchandise keeps your brand in the forefront of clients and potential customers. We will put your logo on glassware, water bottles, hats, shirts, jackets, key chains, pens and so much more! Gifts and giveaways are a lasting way to market your brand. This is how we can help with your next promotion . . .
“If you can imagine it, we can create it!” We are the premier supplier of personalized items for those looking for something truly extraordinary. We invite you to explore our collection of premier gift items. 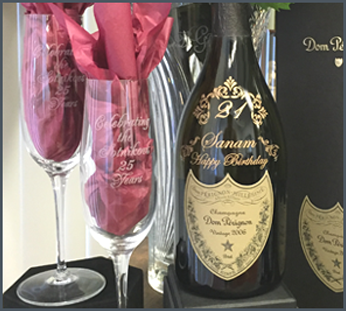 Whether it be champagne, wine, fine crystal or leather goods we can personalize it to create a gift with a lasting impression.